Darren Ambrose, editor of k-punk: The Collected and Unpublished Writings of Mark Fisher (2004-2016), on Orwell, through Pynchon, in the age of Trump. ‘We are the dead,’ Winston said. ‘We are the dead’, echoed Julia dutifully. ‘You are the dead,’ said an iron voice behind them. Suddenly ‘Big Brother’ is revealed as all they had feared – all knowing, all encompassing, all powerful and total. Everything is lost. In that single moment their paranoiac fears about ‘Big Brother’ and ‘The Party’ are irrevocably confirmed. They are not alone: they have been set up, watched, and followed by the Thought Police from the very beginning. They have been manipulated and finally exposed as ‘thought criminals’. As had always been destined, the last vestige of their humanity will now be crushed in the ‘Ministry of Love’ behind the door of ‘Room 101’. In the days following Trump’s election I felt a strong need to re-read Orwell’s Nineteen Eighty-Four. It turns out that I was not alone: sales of the book soared in the immediate aftermath. Its speculative and futural symptomatology feels intimately connected to the present ‘post-truth’ era with its terrifying nihilism; and ‘The Party’s’ ultimate denial of rational human agency where 2+2=5 is all too bitterly familiar. As Orwell writes – ‘Every year fewer and fewer words, and the range of consciousness always a little smaller.’ (p. 61) A new American empire, controlled by elites, is fully engaged with the vigorous creation of its own reality through a sustained project of neurolinguistic programming ranging from immigration, health care, social welfare, race, gun control and taxation. By any means necessary. 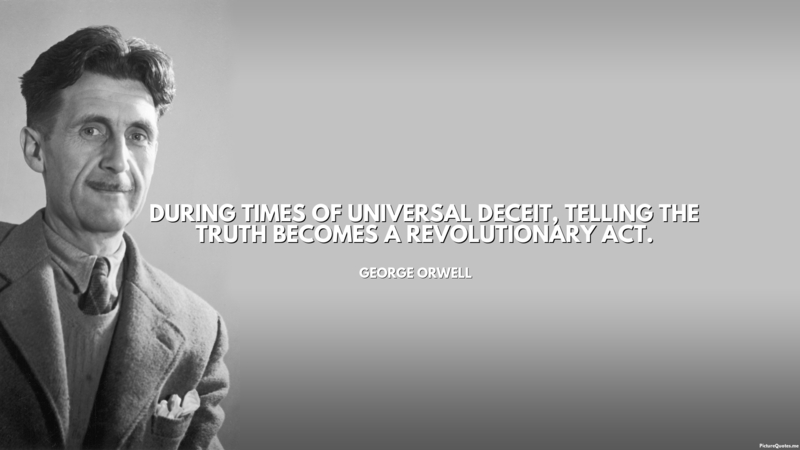 Orwell’s doublethink has become alternative facts. The currents of this right-wing neoliberal construction have been there for all of my life, steadily eroding the previously held consensuses around the social contract, socio-economic objectives, cultural norms, values and beliefs. It is clear that we now stand, nearly two decades into the new Millennium, upon a socio-economic and cultural landscape as dramatically altered by neoliberalism as that of the physical landscape of the Grand Canyon by the Colorado River. We undeniably exist in a very different reality – a ruined, ignorant, greedy, violent, divided, and stupid one. 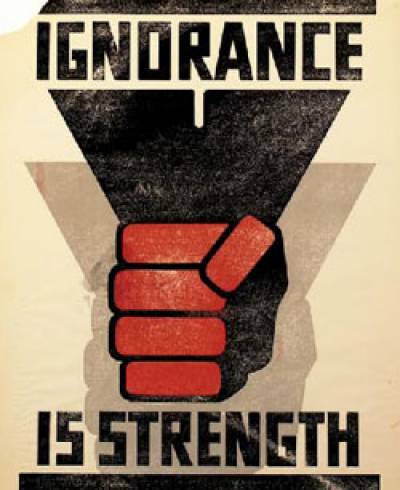 Reading Orwell’s Nineteen Eighty-Four at this point in history is a very painful experience – it reads like a dire warning that went unheeded, a precise analysis and diagnosis that was ignored, and a final confirmation, if one were needed, of what the future became. Last year I felt such a strong need to immerse myself back in the purity of that experience, to dwell in its confirmatory narrative and dystopian vision, like a person senselessly clutching onto a hospital letter confirming their inoperable cancer. I found that my old copy of Orwell’s novel had gone missing, probably in one of the many house moves we’ve made in recent years, and I had to buy a new copy. Whilst the latest Penguin edition has an entirely new introduction by the American novelist Thomas Pynchon, the familiarity of Orwell’s novel was somehow reassuring. We embody a history of the things we have read throughout our lives, and we can read the outline of ourselves from the map of our reading. An irreducible aspect of all of this reading, and no less influential upon what we believe we have become, is what might be called ‘history itself’, the times as they exist outside the text, the place ‘in’ which we carried out all of our reading. All the books we read in our youth, throughout our teens, twenties and thirties, were not only seen through our own eyes but were readings inflected with the times in which we undertook them. There is a doubling of our own age and the broader age within which we read, that make the books what they are for us and what we become for them. 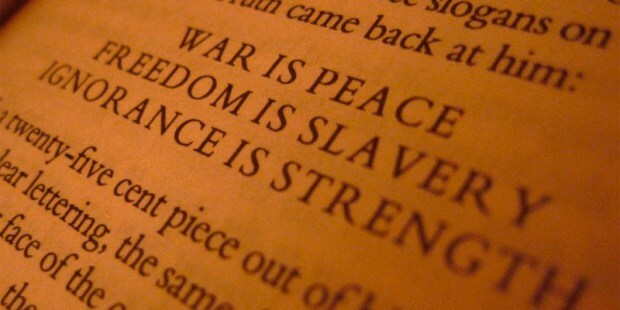 Orwell’s Nineteen Eighty-Four, a book I first read in 1984 when I was 15 years old, remains one of the key books of my life in this double sense. When I got hold of the new Penguin edition of Nineteen Eighty-Four I decided to begin by reading Pynchon’s introduction, which is not something I usually bother doing. I’ve always skipped such introductions, sometimes because of the risk that they usually give away too much of the story, but more often than not they are simply unilluminating and dull. But the idea of the arch post-modernist Pynchon providing the introduction to this novel intrigued me, and there was certainly no concerns about plot reveals as I already knew the events of the novel so well. Pynchon’s introduction provided me with a real shock. Looking back I’m not quite sure what I expected him to write about Orwell’s dystopian masterpiece, but I was extremely surprised by what he did. In a mere 21 pages Pynchon did that very rare, but all-too-welcome, thing; he suddenly and irretrievably altered the way I thought about both Nineteen Eighty-Four and our present predicament. Despite having read Orwell’s Nineteen Eighty-Four numerous times since that first time in 1984 I have never personally left the novel whistling a happy tune in the streets of my own dystopia. There never seemed to me to be anything at all suggestive of redemption and restoration in the novel. However, I found Pynchon’s observation undeniably seductive and entirely convincing. It is difficult to make sense of the reflective appendix given the overwhelming inevitability of Big Brother’s absolute power in the novel itself. The more you think about the presentation and form of the appendix (i.e. its grammar) the more it appears as something written from a completely alien vantage point (albeit in familiar English), literally presented by a visitor from another world at some distant point in the future. This stark incommensurability resonates with something pervasive in the ‘streets of our own dystopia’ where the neoliberal socio-economic hegemony has achieved an almost naturalistic state of being, what Mark Fisher called ‘Capitalist Realism’. The ideology of late capitalism seems not only all pervasive and inevitable, but entirely natural, where imagining the end of the world is easier than trying to imagine the end of capitalism. The axiomatic grammar of capitalist realism renders it absolutely inevitable and permanent. There seems so little hope of resistance given the absolute lack of any convincing alternative. Neo-liberal capitalist ontology has spread its tentacles into every fibre of our existence, its body having become so totally swollen as to have taken up all available space and air in the world. Pynchon’s essay uses Nineteen Eighty- Four’s almost always skipped Appendix, ‘The Principles of Newspeak,’ to reverse-engineer a crack of daylight into Orwell’s hitherto unforgiving midnight of an ending’, and describes Pynchon’s introduction as ‘the finest, deepest, sanest new 20 pages around…[that] wipes the floor with just about anything else published this year. Equally, the smile of Orwell’s son in the photograph is not simply a subjective quality. As Pynchon suggests, it is emblematic of something immanently powerful, something singular ‘worth even more than anger’. It is nothing less than life expressing itself through the indomitable gestures of the child. And it is this indomitability which grounds the sheer nihilistic dystopia of Nineteen Eighty-Four as a warning rather than an historical inevitability. The smile of life is the unassailable light in the darkness, the intangible, imperishable and enduring substance in the nothing of the now. My own son is the same age as Orwell’s in this photograph, and as I read the introduction, I felt an instinctual truth in Pynchon’s observations. They ignited something new in my mind, not dormant or forgotten, but something else. Something new, unsuspected and alive. Amid the hopelessness and despair I was feeling post-Trump, his words actually confirmed something else, something different, something other than the darkness of the present. And it is simple, like a pure sober note rising out of the cacophonous discordant noise of the present crying “Look for the smile, listen for the laughter”. It is there. Like in the simple grammar of Orwell’s appendix. The hope is right there because life is right there. A simple shift in grammar allows the light stream in. We need to shift our own grammar of existence, to gravitate towards alternative spaces of imagination outside of the present world. Because this present world is not all there is. It is not inevitable. It is their world, it is a terrible simulacra of a real world, but it is not our world. It holds sway merely by default. We are trapped in their world, and there we are the dead. We have become instrumentalized, commodified, banalised and reduced. The simple fact though is that they are the dead. The imperative, if we are to ever escape, is to try and strip ourselves back to nothing in the terms measured by their impoverished coordinates; we must become progressively less and less in the reality field they have imposed upon us. We must disinvest from the naturalised grammar of the present existence. We must drift away from the consensus fields we have been conditioned by them to believe as being all there is, from the inevitability of greed, selfishness, self-interest, nationalism, consumption, violence, anger and entertainment. We need to disconnect from the dead network of drives and desires we presently think of as the real world by treating it as something definitively of the past, as a dead-end and a distraction. We need to progressively disappear from their world and start appearing in our own. It is our task to develop an altered grammar to challenge this dead present, to develop the ideas, policies and practices of the future, and to try and keep them alive and available until what currently seems to be politically impossible becomes politically inevitable. Part of this altered grammar is to begin to think and to talk about what else is possible as something realisable, as an inevitability to come. Yet, in what looks like a weird and violent form of ascetic futurism, we must continue to survive in the present by always remaining anchored to that simple yet powerful note of faith in the real world, in all of that life that emanates so generously from the child’s smile – we mark it with words like human decency, goodness, kindness and love. All future alternatives worthy of real life will flow from them.